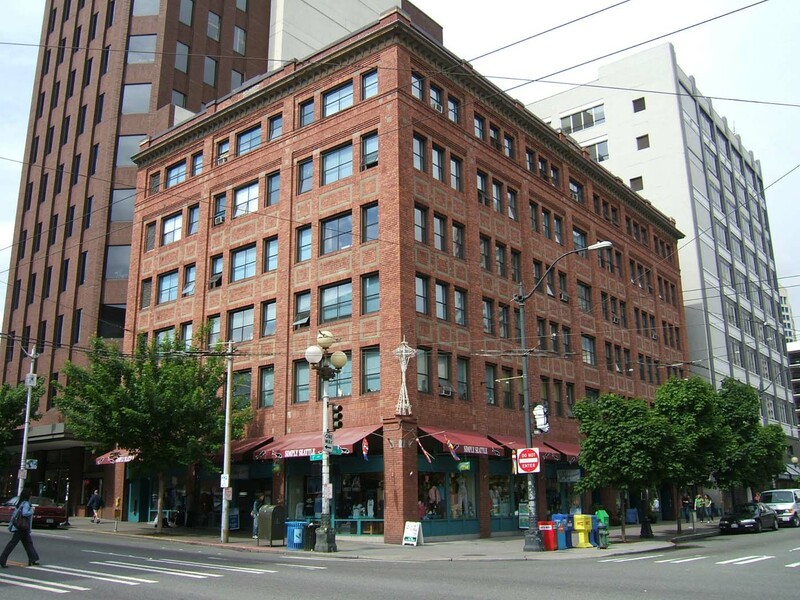 Located at the NE Corner of First Avenue and Pine Street, this former 125-room hotel building includes several retail stores and now functions as an apartment building. It is a six-story masonry structure with a concrete foundation measuring 64’ x 111’ with three wide bays oriented toward First Avenue and seven narrower bays (including a smaller hotel entry bay) at the center of the Pine Street elevation. It exhibits a modest three-part vertical block façade composition accentuated by red brick cladding and modest brick and inlaid concrete details. Architectural features include a sheet metal cornice with corbel table and a stepped central parapet at both of the primary elevations. The sixth floor level is accentuated by inset window bays with corbelled headers and a masonry watertable band below the window sill level that is decorated with inlaid concrete details that correspond with the building piers. The shaft is distinguished by corbel headed window bays with windows set in groups of three and spandrels decorated with inlaid concrete. Original 6/1 double-hung wooden window sash has been entirely replaced by a modern window product with very narrow mullions. The original retail storefronts included multi-pane mezzanine windows, wide display windows and wooden bulkheads; new storefront infill has been installed throughout. There do not appear to be any intact or architecturally significant interior building features, finishes or public spaces. "New Afton Hotel at First Avenue and Pine Street" Seattle P.I. September 4, 1910.